Colon Hydrotherapy is a safe, gentle, effective method of using purified water, under regulated temperature, to help with the removal of waste remaining in the colon, eliminating the accumulation of toxin and waste and encouraging the large intestine to carry out its natural peristaltic action, and therefore promoting a clean, healthy body. A toxic colon is a major factor in the development of food intolerance leading to chronic ill health. You cannot expect to be well if the main organ responsible for ridding the body of toxic waste is under-functioning. When the colon is irritated by diet, stress, drugs, chemicals, and other substances, it tries to protect itself by producing more mucus. This additional mucus can bind with the sludge from refined foods, such as white flour, and build up on the wall of the bowel, narrowing the lumen. This layer of gluey, hardened feces can weigh several pounds and is a good place for harmful organisms to breed. Do not think because you have regular bowel movements, or even diarrhea, that you have escaped this problem. The stool can pass daily through a dirty colon and leave the accumulated residue on the walls behind. There is no need to get panicky about the amount of weighty garbage you might be carrying around with you: there is a great deal you can do about it. Colon cleansing is the first step on the road to recovery. When you have cleansed your colon and restored the balance of the good and bad bacteria, when you have adequate production of enzymes and your dietary intake and internal production of vitamins is correct, our food intolerance should greatly improve or disappear. The benefits of colon cleansing are many, not only in terms of health, but also as it relate to appearance: the skin looks vibrant; cellulite, water retention, and blemishes disappear; and the whites of the eyes regain a youthful clearness. How quickly you want to clean out your colon is your choice. Some people are so tired of being under par, they are willing to endure the effects of rapid cleansing. Possible side effects from this procedure include migraine headaches, blinding headaches, nausea or flu, aches and pains, fever, exhaustion, and nervous symptoms such as anxiety, panic attacks, irritability, weepiness, and even profound depression. 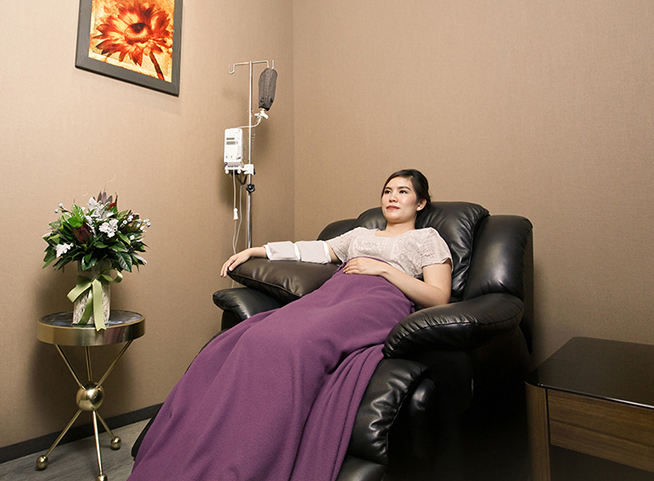 Colon Hydrotherapy is a comfortable experience for most people. The procedure involves a soothing flow of purified, temperature-regulated water, inserted gently into the colon through a thin rectal tube, stimulating the colon’s natural peristaltic action to release softened waste. The inflow of a small amount of water and the release of waste may occur several times during a session. The removal of waste encourages better colon function and excretion. Before each treatment, center’s consultant will makes arrangement for each client to meet with resident doctor, who are able to provide the relevant information and answer any health-related questions or concerns. Resident doctor also conducts a thorough physical examination and take blood pressure measurements in order to ensure that each client is physically able to undergo treatments. At the end of the procedure, Bifidus (friendly bacteria) or Acidophilus will be given orally or through rectal infusion to maintain the balance of healthy elements in your body. The whole session lasts approximately 40 minutes. Our therapists aim to make your session relaxing, private and dignified. The water used for the therapy undergoes as much as five purification processes. This purified water is also known as RO water and is processed through imported U.S. Reverse Osmosis water treatment plant, which produces kidney dialysis grade water of the purest quality. And as a result, clients can be relieved of any worries about the quality of the water used for a detoxification session – the water is 100% pure and natural. How Long Does It Take to Clean the Colon? It is unlikely that you will have a cleansed colon within a couple of weeks: it could take months. You will know when things are happening: your skin and eyes will look clearer, your digestion will improve, you will have more energy, and nagging aches and pains that have been around for years will disappear. You could feel mentally better too, clear-headed, and less jumpy. Conditions such as active infections, active inflammation (such as diverticulitis, Crohn’s disease, ulcerative colitis), a painful fissure or painful haemorrhoids mean treatment cannot be comfortably carried out until they are healed or in remission. Diseases such as congestive heart disease, severe uncontrolled hypertension, severe anaemia, liver cirrhosis, kidney disease, severe haemorrhaging and colo-rectal carcinoma are also absolute contra-indications for treatment as are some physical conditions such as severe abdominal or inguinal hernias which cannot be easily reduced.Treatments are also not performed during the first three months of pregnancy, and not at all during complicated pregnancies.